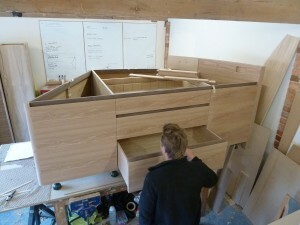 Since the end of Dorset Art Weeks we have only really been working on one large project, our biggest kitchen to date, it’s also our most complex. 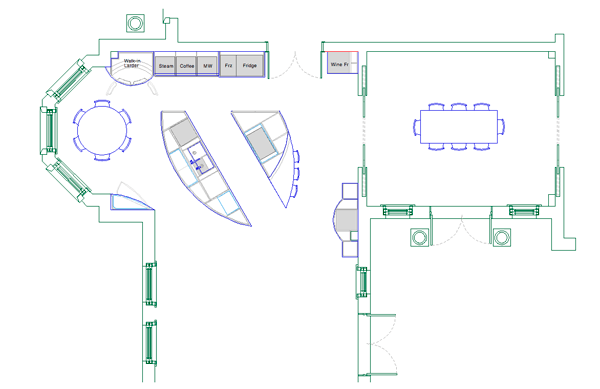 It is of course going to be stunning, with two large islands, a wall of cabinets for ovens and fridges, a big walk-in drum larder, a display / drinks cabinet and various other pieces. As you can see from the floor plan there is nothing predictable about this layout, the islands run at an angle with a gangway between them. The islands are called ‘Fire’ and ‘Water’- one being for the wet services: sinks, dishwasher, zip tap etc, the other being where the cooking takes place – hence ‘Fire’. There is an huge dropped canopy for lighting and extraction over the islands which looks a little ‘close encounters’ right now! So far both islands, the display cabinet and the walk-in larger are complete. 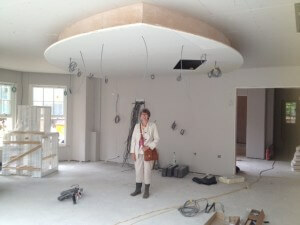 We are due to be on site fitting in Poole late October. The materials pallet has been fun: elm, burr elm and black walnut on the cabinetry. We have been working with Woadden Nash Interiors on the other textures and colours in a space that also opens out into an ‘orangery’. The work tops are in stunning Meteorus granite which proved really difficult to track down this time – we had used it in a previous kitchen in North Dorset to striking effect! 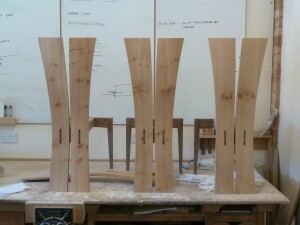 We are also making a dining set for the space so are using our new Gabriel chairs around a circular table. The combination of black walnut and a native pippy elm is very beautiful, they may just be the nicest set of chairs we have ever made! 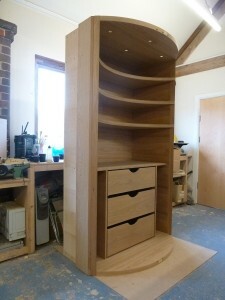 The curved door walk-in larder unit is as big a single piece of cabinetry as we have ever made. 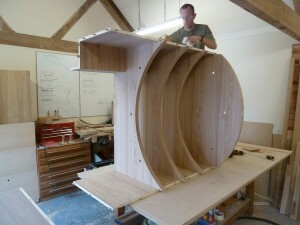 To carry on the sci-fi references it looks rather like our very own bespoke workshop tardis, just rather more curvacious! 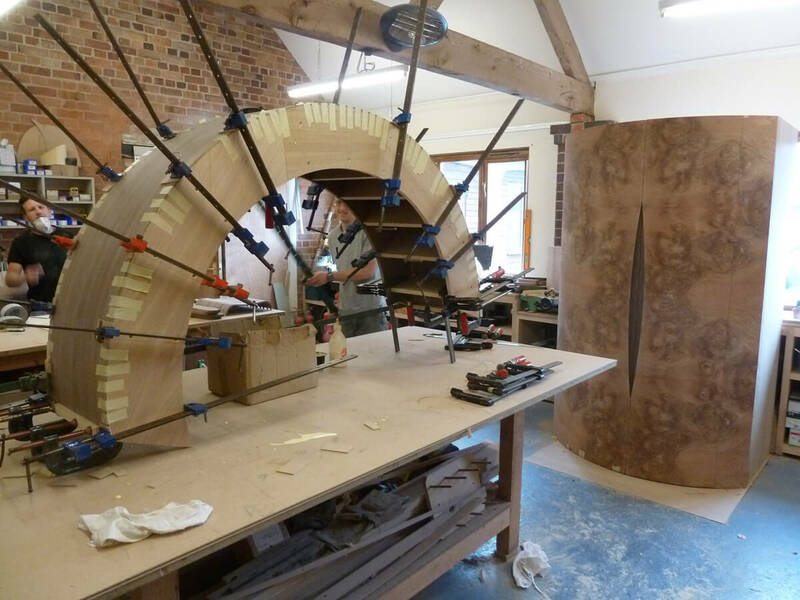 We are using burr elm on the outside of this as well as on the sideboard element of the ‘Water’ island (facing the table) and on the curved centre drinks / display cabinet; these become the ‘feature pieces’. 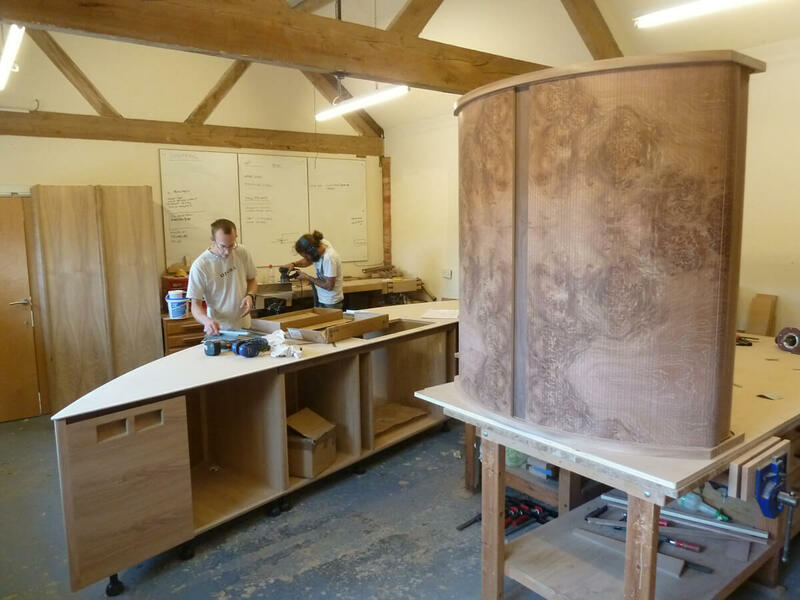 The image at the top of this story shows the burr elm sliding tambour which is the top section of that drinks cabinet, the 4 metre long ‘Water’ island is behind it.